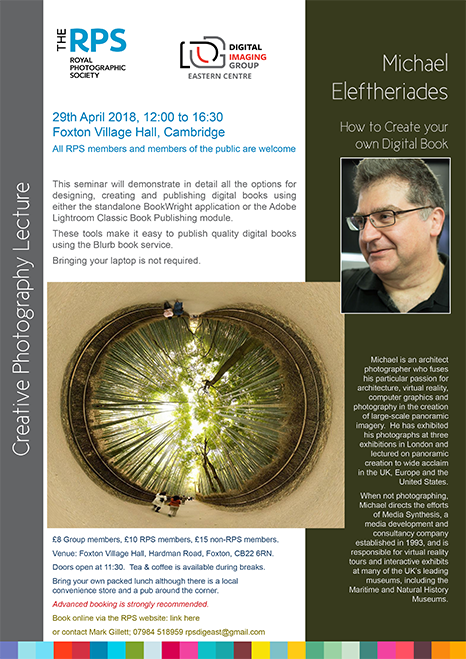 This seminar will demonstrate in detail all the options for designing, creating and publishing digital books using either the standalone BookWright application or the Adobe Lightroom Classic Book Publishing module. These tools make it easy to publish quality digital books using the Blurb book service. Michael is an architect photographer who fuses his particular passion for architecture, virtual reality, computer graphics and photography in the creation of large-scale panoramic imagery. He has exhibited his photographs at three exhibitions in London and lectured on panoramic creation to wide acclaim in the UK, Europe and the United States. When not photographing, Michael directs the efforts of Media Synthesis, a media development and consultancy company established in 1993, and is responsible for virtual reality tours and interactive exhibits at many of the UK’s leading museums, including the Maritime and Natural History Museums. The venue for the lecture is the Village Hall in Foxton which is centrally located, provides good parking and is also serviced by the train station. As always, you don’t have to be an RPS member to attend the lecture – all are welcome. Tickets are £15 for non-RPS members, £10 for members of the RPS and £8 for DIG members. Doors open at 11:30, the seminar starts at 12:00. Get details of the event and book on-line (requires an account) from the RPS website directly here, or to reserve your place, either e-mail rpsdigeast@gmail.com or call Mark Gillet on 07984 518959.